The HSM Powerline 450.2 1688 (formerly known as the 450.2 Professional) is a 2x15mm Micro Cut shredder. It is a mobile, High Performance Security Departmental Shredder with a large collecting capacity. 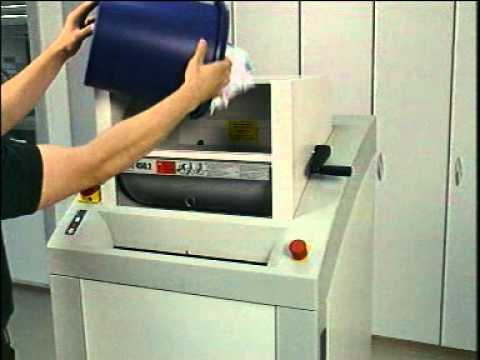 An integrated rolling hopper assists in the destruction of crumpled paper and can destroy entire computer listings in one pass plus floppy disks, CD's Store and Credit Cards etc. Auto start stop via photoelectric cell plus auto stop when container is full. Auto reverse in the event of a jam. The HSM Powerline 450.2 1688 has a Removable trolley to exit the reusable waste bag. The use of a P-5 shredder such as the Powerline 450.2 will aid your GDPR compliance. This machine is designed for exceptionally heavy usage by a single user or a large shared office space.